My neighbour has a map of the world on the wall. You can see it from the street in front of his house. It has a backlight but that only illuminates half of the map. The transition from day to night is shaped like a sine wave most of the time. It actually is a physical world sunlight map. Of course, you can simulate this with a computer too. There even is an instance using Google maps. As many roads lead to Rome multiple ways are possible to this simulation. One could model the sun, earth, maybe more and start ray tracing. This approach would include solar eclipses but is quite heavy by means of the load on the processor. Because of the number of calculations involved in ray tracing is quite high. The way I choose to describe fully in this article is one close to it. Using vectors pointing from a sphere (earth) to a point (sun) I map a Mercator projected map of the world on the sphere. The challenges included are the yearly orbit of earth around the sun and it’s 23.5° tilted 24 hour spin. About a decade ago I made a similar program in highschool. I didn’t know vectors and trigonometry then as I do now. Back then I used to have the map of the world where for each longitude (the ones parallel to the equator) I calculated sunset and sunrise times for that longitude. This way I knew when to start painting night over the daylight map I had. This result was pretty accurate and an algorithm to determine those solar times is not hard to implement. This time I used another more advanced approach to the problem. First let us define a mathematical 3D space, with three axis: (pointing from left to right), (pointing up) and (pointing into your monitor). Pointing directions are given to help your imagination. Axis point from small (negative infinite) to big (positive infinite), they intersect at . Define a sphere on point , with a radius of 1. This will be the earth. The funny thing is that for every point (x,y,z coordinate) on the earth, because the earth is centered around , automatically is the same a the vector pointing orthoganally away from the earth starting on that point . This comes in handy when we do calculations later on. With this approach we actually make the sun rotate around the earth. 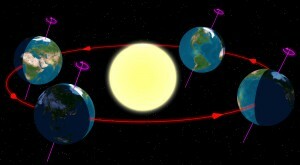 Tilted orbit of the spinning earth around the sun. The method discussed here turns it around as it models the sun orbitting the earth. Now this observable tilt is the angle there is between what is the real direction to the sun and the already calculated direction d. To calculate the vector ( component, pointing up or down) which should be added to to get the real direction you can use tangens. Using the dot product (or scalar product or inner product) you can calculate the angle between two vectors. Or, if the vectors are both normalized (length = 1) it is the projection of the one vector onto the other. So if we calculate the dot product for every normal vector from the surface of the earth ( ) with we should get some meaningful results. If the the sun is in another direction so is pointing to the night side of the earth. If that piece of earth recieves solar light. Now we can for each coordinate on the map if it should be displayed as day or night. Because you know the angle the sunlight makes with the earth’s surface you can make add some shading by making it increasingly dark on the edges of the day. It the dot product of and is smaller than 0.1 ( ) the point is in dusk or dawn and you could mix day and night as a gradient to make the difference between them look more fluently. Another joke is the reflection of the sun: if the product is greater than, let’s say, 0.95 ( ) the sun is approximately orthogonally above that coordinate an you could make it more white to have it look like the sun is reflecting in the map. A demontration of this method is available at the edesign example site. There are a number of assumptions done and restrictions set while creating this demo. 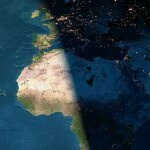 Live sunlight map generated using the algorithm discussed in this article. Click the image to go to the example page where you can override current time. I assumed the solar rays are parallel. The distance from the sun to the earth is huge, but it is actually wrong to assume rays are parallel. They are only by approximation so it is good enough for this simulation. Because of this assumption, the night ’starts’ exactly at the half of the world in the shade while actually this is different. The sun is far bigger than the earth and therefor some rays should be able to reach the shadow half of the earth (near the limit depicted in the first image). By approximation I eliminated this too. Timing is not very accurate. As well as for the 24h clock as for the solstices rough estimates are used. A perfect sphere is taken as world. No fattening is modelled (polar radius should be smaller than equatorial radius). The ‘fun with shading’ should implement something to make land mass not reflect sunlight. This entry was posted on Thursday, May 14th, 2009, 02:59 and is filed under Algorithms, Image processing, Simulation. You can follow any responses to this entry through RSS 2.0. You can leave a response, or trackback from your own site. Tried your script, but it doesn’t generate map picture. Not sure, but it might be because of “header already set” problem. t.i. do you have any tip? What web server you use? These “headers already set” error is usually caused by some echo/print output or any content outside of your tags. You should locate the line causing the output of your script. Btw, I use Apache 2 httpd. Hi very nice work! Really! I’m planning to use your script to generate a sunlight map for a project. Unfortunately I’m using a flat mercator projection (not projected on a sphere) and I can’t understand how to change the math to create a proper sunlight map. Could you give me some suggestions? Thanks! Actually, the image you see here is a mercator projection. The sphere I’m talking about is just a modelling trick to calculate illumination for the map. The part about ‘mapping’ is where I discuss the transformation from the sphere model to the 2D mercator map, the result. Contact me if you need more help. Thank you for vivid and professional documentation. Would it be possible to download your bigger images, too (i.e. day.png and night.png) instead of just the _live versions? Thanks!!! These images are made by NASA. I just mailed them to you. If you want the even bigger versions (originals) you should check at the nasa website. They’re free. Great information, thanks…but I believe you have a small correction to make: you say longitude are the lines parallel to the equator, I believe you meant to say perpendicular to the equator? But I have a problem running your code : Undefined variable: rgb on lines 207 and 208 on map.php file. Where does this variable comes from? Excellent article thank you. This seems to be the only page explaining it, and in a very clear way. However, please note there are several inconsistencies between mentioned equations and your source code. Only by looking at the JS code was I able to reproduce the correct behavior. To do this we must use sine and cosine. On time the direction of the sun will be , which is a vector pointing to the right. On (hour) that should be pointing right . It seems to be pointing right at both times??? I truly appropriate you posting this. I’m attempting to generate a very stylized world map with a cloud overlay and now lighting. Your great description from 2009 is helping five years later!! I look forward to playing with the PHP code linked, which should speed things up significantly. Hello. Thanks for sharing. But where i can download this script? I can see any download link. thanks. i found codes on live example page. bug index.php gives render.png not found error. Please have a look at the example. On the bottom left you’ll find links to the sources. Because I need to calculate the angle between the direction of the sunlight the surface of the earth. Hi, many thanks for the explanation and code! we cannot generate equation from it so we do not need any iteration and lot of time for calculation. if we can generate a relation between longitude and latitude with the plane parallel to the direction of the sun and intersected with earth ?